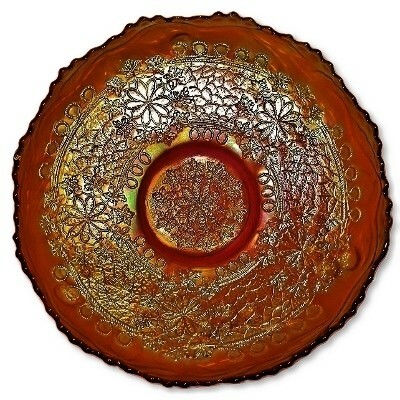 The Fenton Art Glass Company was founded in 1905 by Frank L. Fenton and his brother John W. Fenton in an old glass factory building in Martins Ferry, Ohio. 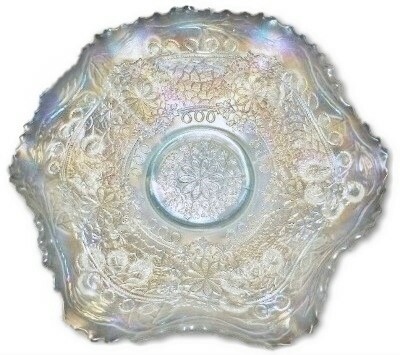 The first glass from the new Fenton factory in Williamstown, West Virginia, was made on January 2, 1907. 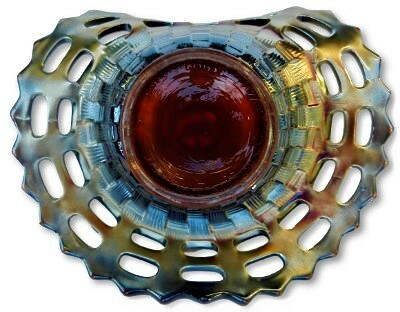 Frank L. Fenton's desire to develop new and unusual colors helped to keep Fenton in the forefront of the handmade art glass industry. 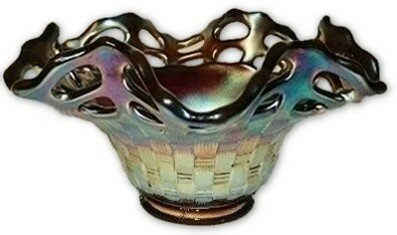 During the years from 1905 to the 1920's, Fenton made iridescent glass. 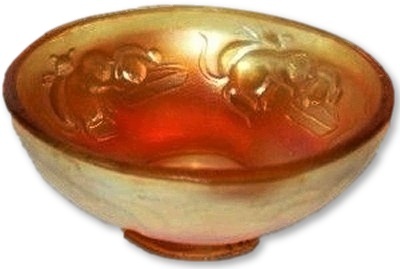 Dark marigold KITTENS toy cereal bowl. 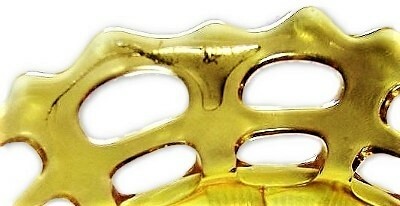 Measures 3 1/2" X 1 1/2". No chips, cracks or repairs. 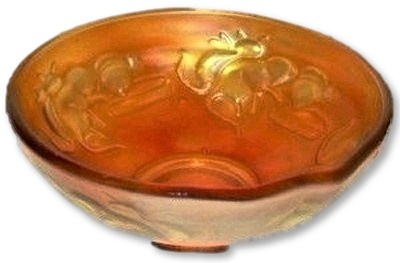 Marigold KITTENS toy cereal bowl with pour lip edge. 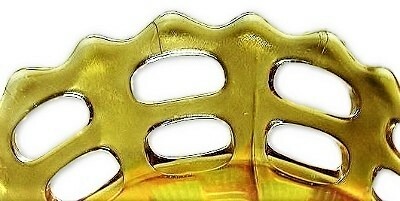 Measures 3 1/2" X 1 1/2". No chips, cracks or repairs. 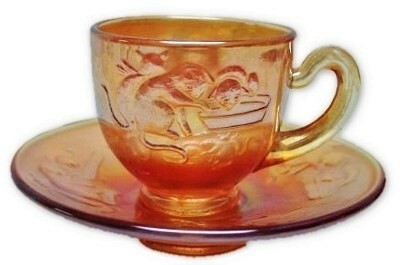 Deep marigold KITTENS miniature cup & saucer. 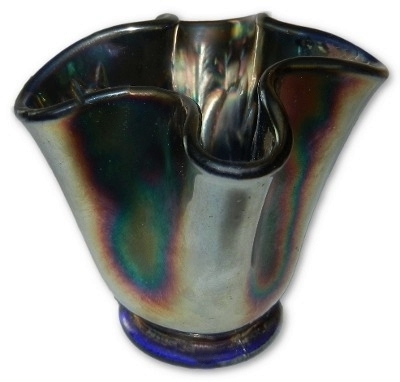 The cup measures 3 1/4" across from the outside of the handle to the outside of the rim and sits 2 1/8" high. 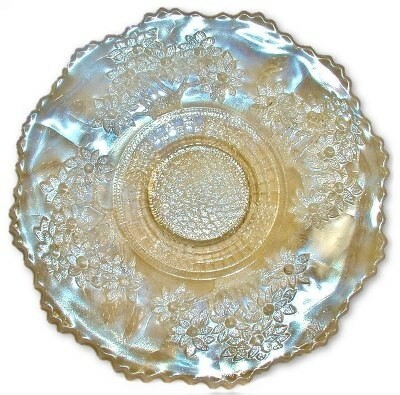 This saucer measures 4 1/2" across and sits only 3/4" high. No chips, cracks or repairs. Dark marigold KITTENS two sides up miniature toy dish. Measures 4 1/2" X 4" X 1 1/2". No chips, cracks or repairs. Marigold KITTENS two sides up miniature toy dish. Measures 4 1/2" X 4" X 1 1/2". No chips, cracks or repairs. 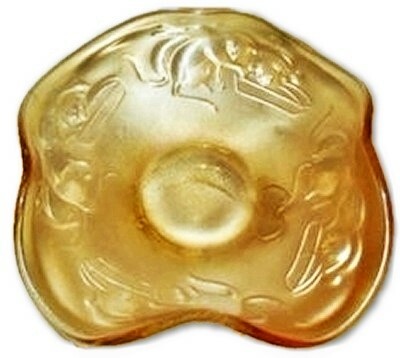 Champagne marigold KITTENS 4 side up dish. 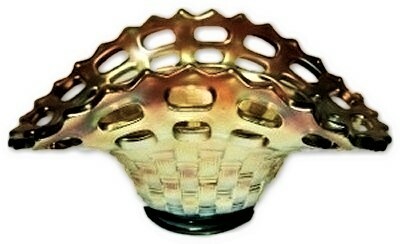 This item is not a washed out marigold, the iridescent finish is complete and the satin effect stunningly pleasant. . Measures 4 3/4" X 1 1/4". No chips, cracks or repairs. Dark marigold KITTENS 4 side up dish. Measures 4 3/8" X 2 5/8". No chips, cracks or repairs. 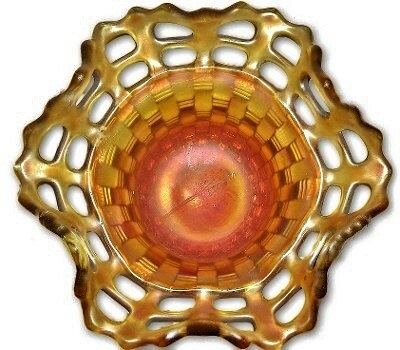 Marigold KITTENS pattern toy ruffled edge dish. Measuring 4 1/2" across and sitting 1 1/2" high. No chips, cracks or repairs. Pumpkin marigold KITTENS pattern toy ruffled edge dish. Measuring 4 1/2" across and sitting 1 1/2" high. No chips, cracks or repairs. Cobalt blue KITTENS toy 4 side toothpick holder. Measuring 3 1/2" X 2 1/2". 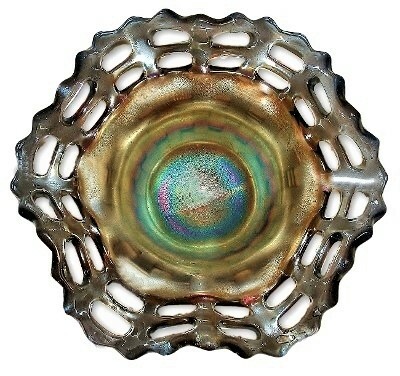 There is an internal crack that can be seen only when the item is held to strong light starting just above the base rim and extends toward the top. This crack does not extend to any of the edges and appears to be contained within the glass only. 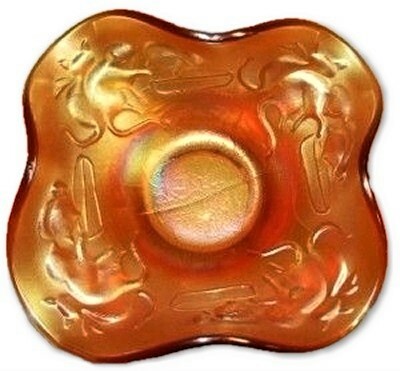 Marigold KITTENS toy 4 side toothpick holder. Measuring 3 1/2" X 2 1/2", this item has a small scratch to the finish and is in overall very good condition. No chips, cracks or repairs. 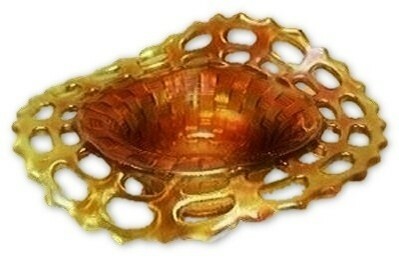 Dark marigold KITTENS toy 4 side toothpick holder. Measuring 3 1/4" X 2 1/2", this item has a tighter crimp to the top making it more of a whimsy version than one usually encounters. There is a tiny flea bite flake on one of the ruffles. No other chips, cracks or repairs. 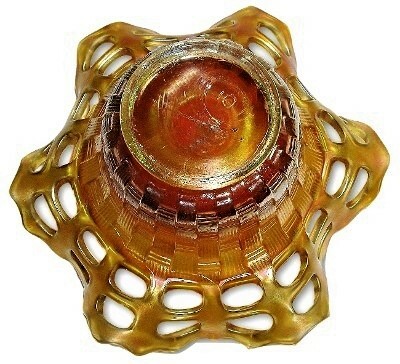 Pumpkin marigold Leaf Chain & Bearded Berry ice cream shape bowl (ICS). Measuring 8 1/4" X 2". No chips, cracks or repairs. 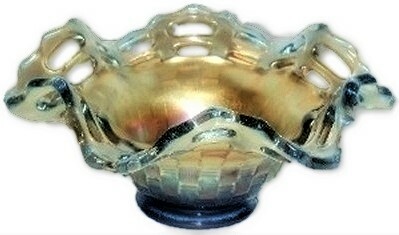 White, frosty, and iridescent LEAF CHAIN with BEARDED BERRY back pattern ice cream shape bowl. 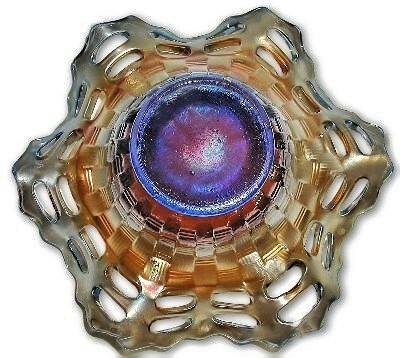 The base glass has a very soft blue cast to the glass itself and makes this a true one of a kind and color item. Measures 8 1/8" across and sits 2 1/2" high. No chips, cracks or repairs. 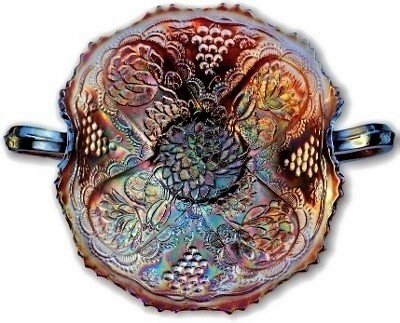 Pastel marigold UV reactive Leaf Chain & Bearded Berry ruffled bowl. Measuring 9" X 2 1/2". 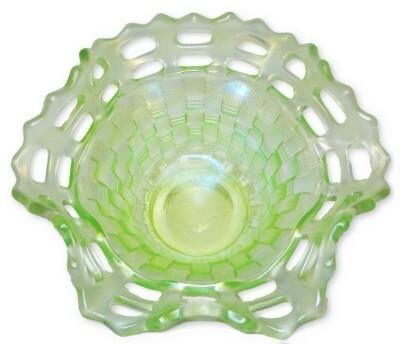 When a black UV light is heald to the base of the bowl in a dark room it the glass glows green. There is a very small in the making rough spot of extra glass on the very edge of one rim point which is not damage and absolutely is from the manufacturing process. No chips, cracks or repairs. 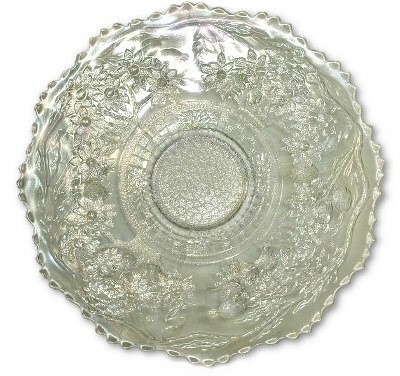 Fenton frosty white Leaf Chain with Berry and Leaf Circles back pattern ruffled bowl. Measuring 7 1/4". No chips, cracks or repairs. 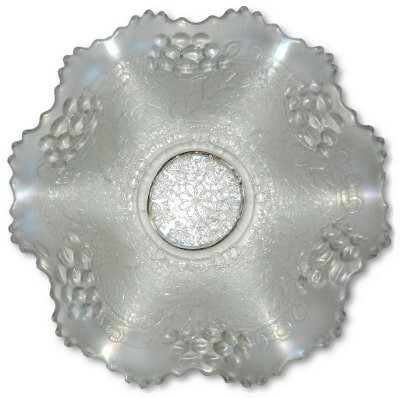 White LEAF CHAIN with Bearded Berry back pattern ruffled bowl. 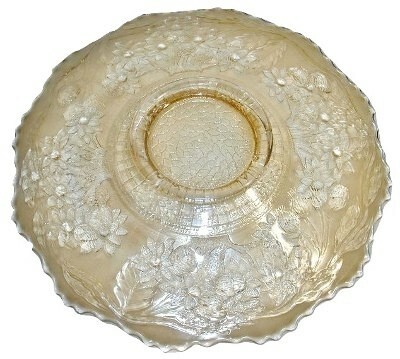 This example has a nice even frosty iridescent white finish on the front and back. Measures 9" X 2 3/4". No chips, cracks or repairs. 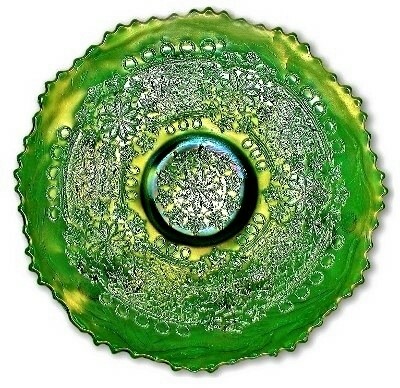 Green LEAF CHAIN with BEARDED BERRY reverse pattern plate. 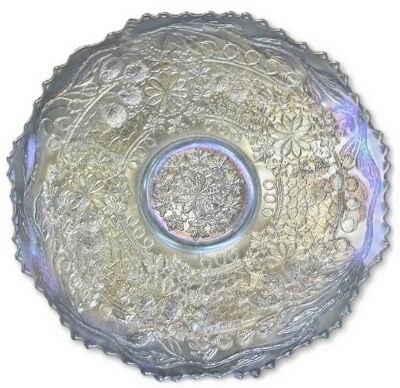 This item measures 8 1/2" across and sits 1 1/8" high on a flat surface. No chips, cracks or repairs. 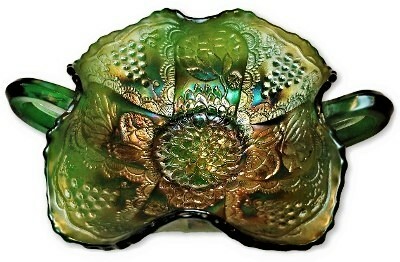 Emerald green LEAF CHAIN with BEARDED BERRY reverse pattern plate. 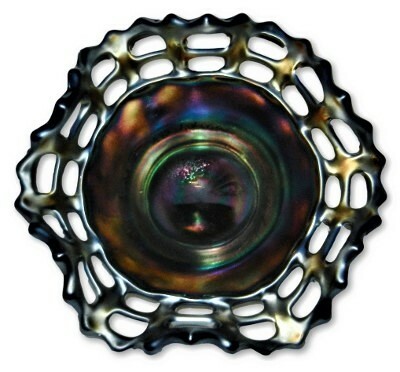 The front iridescent finish has a great deal of blue which makes this example stand above the average version of this plate. Measures 9 1/2" across and sits 1 1/4 high on a flat surface. No chips, cracks or repairs. 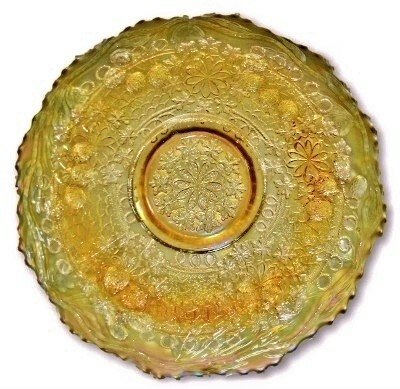 Pastel marigold Leaf Chain and Bearded Berry 9 1/2" plate. This item is darker than clam broth and lighter but just as rich. Measuring 9 1/2" X 1 1/4".No chips, cracks or repairs. 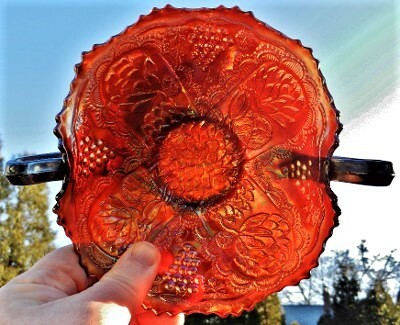 *RARE* uranium (possibly Vaseline) & marigold LEAF CHAIN with BEARDED BERRY back pattern plate! 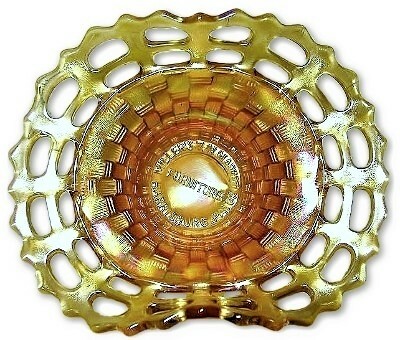 Uranium reactive and Vaseline Leaf Chain plates are RARE and almost never come to the market. This item glows green when a black light is held to the reverse side in a darkened room. Measures 9 1/2" X 1 3/8". No chips, cracks or repairs. 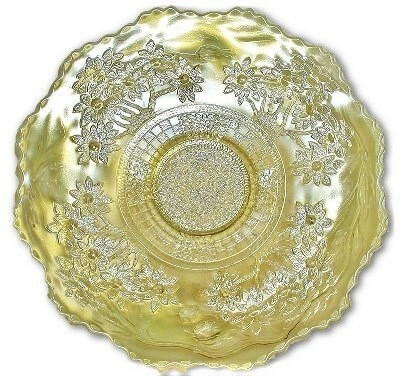 FENTON "LEAF CHAIN with BEARDED BERRY" reverse pattern plate. This plate has a fair amount of blue in it and almost could pass for a very light ice blue!. Measures 9 1/2" across and sits 1 1/4 high on a flat surface. No chips, cracks or repairs. 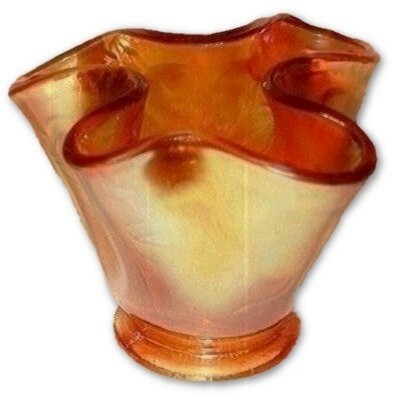 Lavender and amber LONG THUMBPRINT 11" vase. 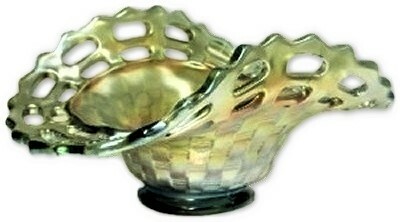 Normally this is a commonly found vase in green and sometimes in amethyst. 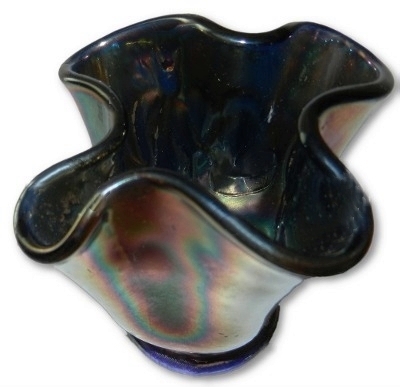 When this vase is held to strong light, only the center of the base shows as lavender! 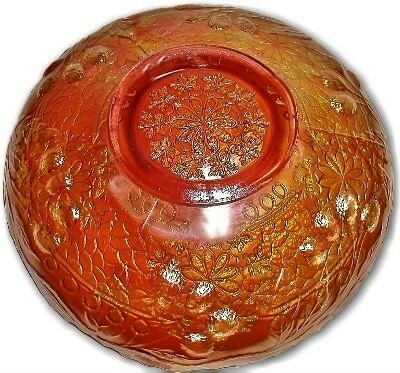 An absolutely beautiful example with minor rub wear to the finish and no star on the base. Stands 11" tall and measures 3 3/8" across the base. No chips, cracks or repairs. Candy apple red slag (base only) LOTUS & GRAPE 2 side up, handled bonbon. Measures 8 1/4" X 7 1/4" X 2 3/4". 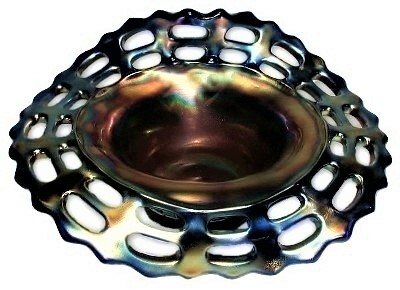 Outstanding iridescent finish. No chips, cracks or repairs. 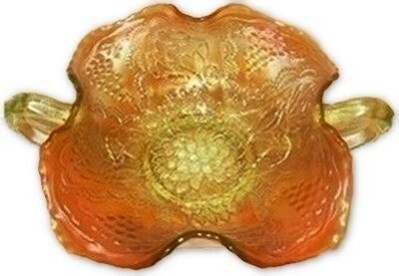 Pumpkin over Vaseline LOTUS & GRAPE two handled bonbon card tray. This is an extremely difficult to find color combination on a stunning pattern! Glows bright yellow/green when a black light is held nearby. This item measures 8" X 7" X 2 1/2". No chips, cracks or repairs. 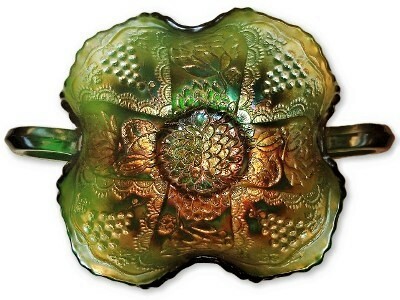 Fenton green "Lotus and Grape" 2 handled square bonbon or card tray. 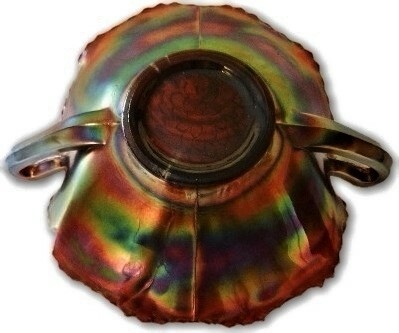 Excellent iridescent finish on this example. Measures 7 3/4" X 7" X 3" high. No chips, cracks or repairs. 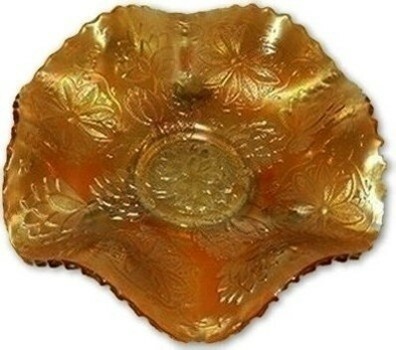 Vaseline and Marigold LOTUS & GRAPE two handled bonbon card tray. This is an extremely difficult to find color combination on a stunning pattern! Glows bright yellow/green when a black light is held nearby. This item measures 7 1/2" X 7" X 2 5/8". No chips, cracks or repairs. 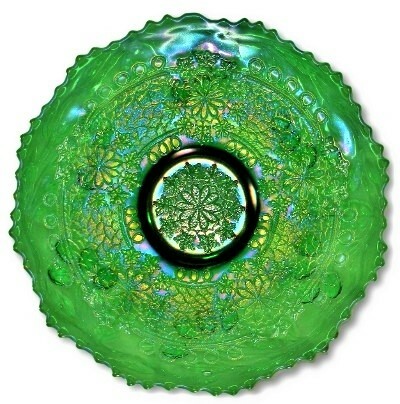 Uranium reactive glass LOTUS & POINSETTIA 3 scroll footed sauce dish. Measures 6" across and sits 2" high. No chips, cracks or repairs. 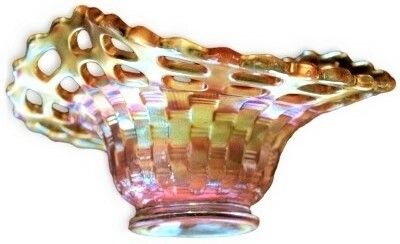 Colorful iridescent finish on cherry red/amberina two side up Open Edge basket. Basket weave exterior. Measures 6" X 4" X 3". No chips, cracks or repairs. 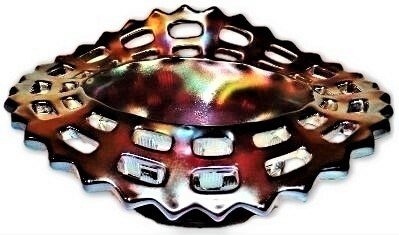 Ice aqua 2 side up OPEN EDGE hat basket. The base color on this item is the most magnificent pale aqua you would ever wish to see. Measures 6"X 4 1/2" X 3". No chips, cracks or repairs. Aqua and marigold 2 side up OPEN EDGE hat basket. 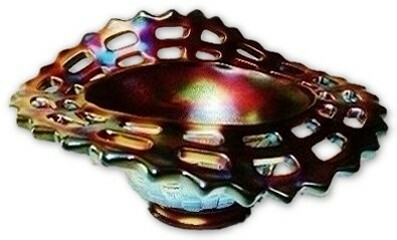 The highly iridescent finish is so effective on this example. Measures 6"X 4" X 3". No chips, cracks or repairs. 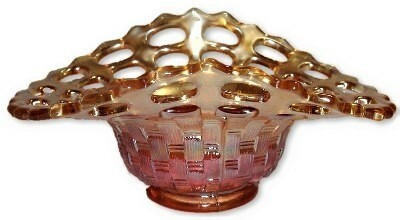 Pink base glass with marigold iridescent finish 2 side up OPEN EDGE hat basket. Measures 6"X 4" X 3". No chips, cracks or repairs. 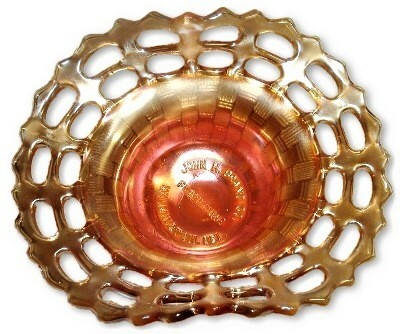 Marigold lettered Open Edge advertising basket. The interior of this two side up Open Edge Basket has the raised advertisement for "JOHN H. BRAND CO. FURNITURE WILMINGTON. DEL." This item measures 6" X 5" No chips, cracks or repairs. 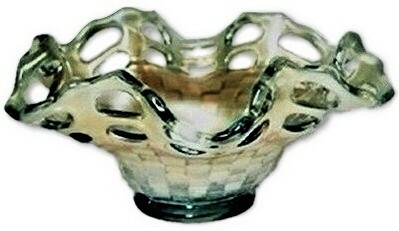 Frosty white iridescent two sides up Open Edge Basket with the basket weave exterior. This item measures 7 1/4" X 5 1/2" X 2 7/8". No chips, cracks or repairs. 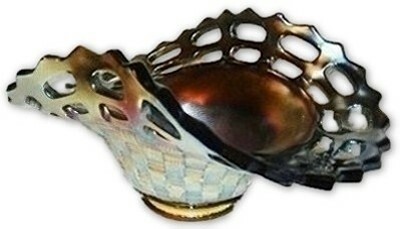 Aqua blue & butterscotch 4 side up Open Edge basket. Measuring 5 1/4" X 2 1/2". Two of the Open Edge webs have back side fracture/cracks which are notorious for this particular pattern and shape. 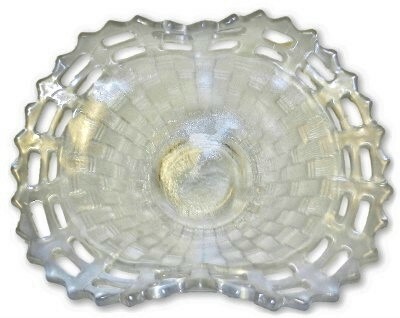 They have associated flakes of glass out of the back sides of the hairlines while they are extremely difficult to see from the front of the item. No other chips, cracks or repairs. 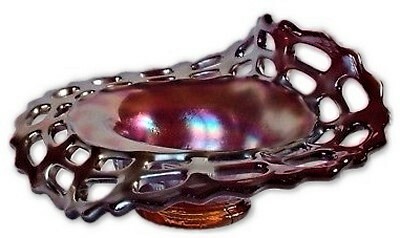 Black to cherry red iridescent finish on cherry red/amberina ruffled Open Edge basket. Basket weave exterior. Measures 5 1/2" X 2 3/4". No chips, cracks or repairs. 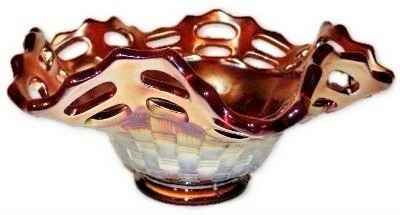 Magnificent cherry red iridescent finish on cherry red/amberina ruffled Open Edge basket. Basket weave exterior. Measures 5 3/4" X 2 1/2". No chips, cracks or repairs. 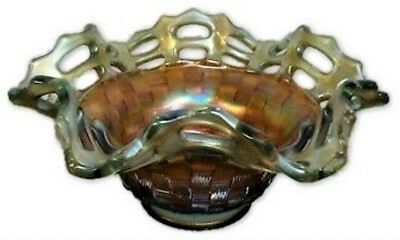 Aqua ruffled OPEN EDGE hat basket. The base color on this item is the most magnificent soft aqua you would ever wish to see. Measures 5 1/2" X 2 3/4". No chips, cracks or repairs. 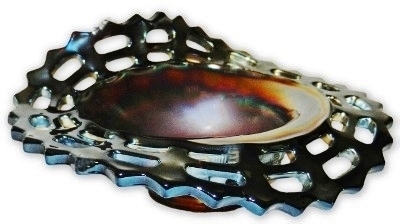 Fenton scarce ebony on black glass Open Edge basket. Measures 6" X 2"/ No chips, cracks or repairs. 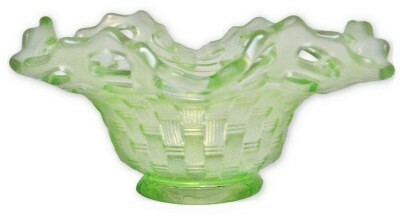 Ice green ruffled Open Edge basket. Measuring 5 1/2" X 2". No chips, cracks or repairs. Powder blue, lavender ruffled Open Edge basket. This wonderful item has the beautiful base color glass of Lavender and powder blue which is covered with a nicely iridescent marigold finish. Measuring 5 1/2" X 2 1/2". No chips, cracks or repairs. Powder blue ruffled Open Edge basket. . Measuring 5 1/2" X 2 1/4". No chips, cracks or repairs. 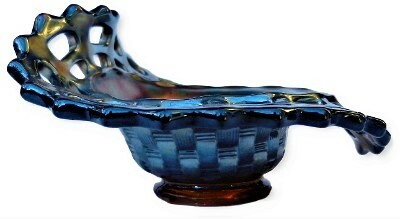 RENNINGER blue ruffled Open Edge basket. 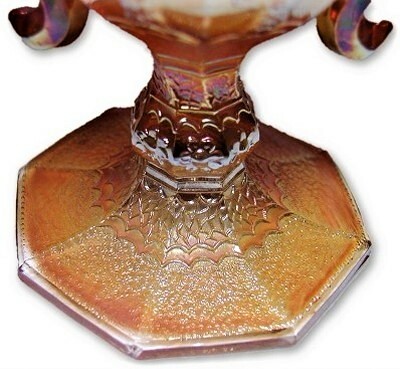 This wonderful item has the beautiful base color glass of RENNINGER blue which is covered with a nicely iridescent marigold finish. Measuring 5 3/4" X 2 1/4". No chips, cracks or repairs. 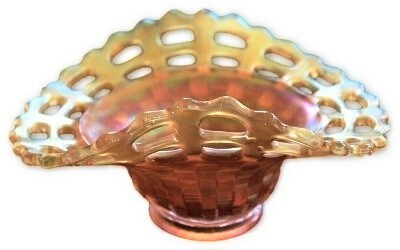 Sapphire blue & butterscotch ruffled Open Edge basket. Measuring 5 1/2" X 2 1/2". No other chips, cracks or repairs. 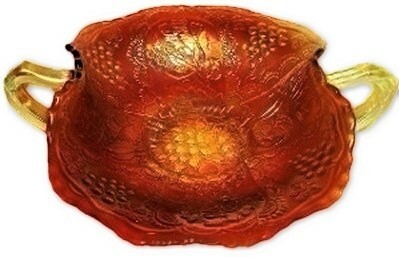 Vaseline with deep reddish butterscotch Open Edge ruffled basket. Measures 5 3/4" X 2 1/2". When held to a black light glows a brilliant yellow/green. No chips, cracks or repairs. 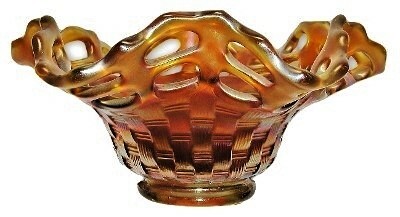 Vaseline with butterscotch Open Edge ruffled basket. Measures 5 1/2" X 2 1/2". When held to a black light glows a brilliant yellow/green. No chips, cracks or repairs. 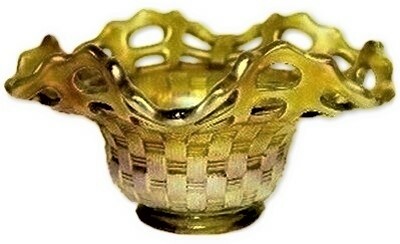 Vaseline with marigold Open Edge ruffled basket. Measures 6" X 2". When held to a black light glows a brilliant Yellow/green. A few of the pulled tips are slightly sharp to the touch. No chips, cracks or repairs. 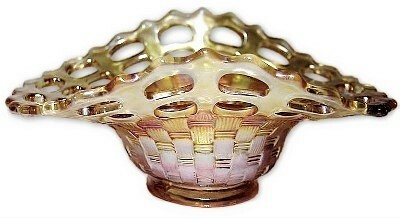 Vaseline and pastel marigold ruffled Open Edge basket. Glows a yellow/green when held to a black light. Measures 5 1/2" X 2 1/2". No chips, cracks or repairs. Black to cherry red iridescent finish on cherry red/amberina Open Edge jack in the pulpit. Basket weave exterior. Measures 6" X 5" X 2 3/4". No chips, cracks or repairs. Black to cherry red iridescent finish on cherry red/amberina Open Edge jack in the pulpit. Basket weave exterior. Measures 6" X 5 1/2" X 2 1/2". No chips, cracks or repairs. 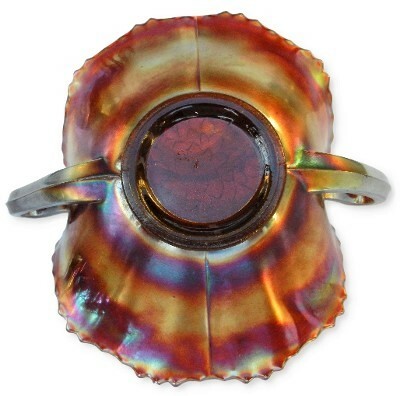 Cherry red iridescent finish on cherry red/amberina Open Edge jack in the pulpit. Basket weave exterior. Measures 6" X 4 1/4" X 3". No chips, cracks or repairs. Aqua Open Edge Jack in the Pulpit (JIP) shape. 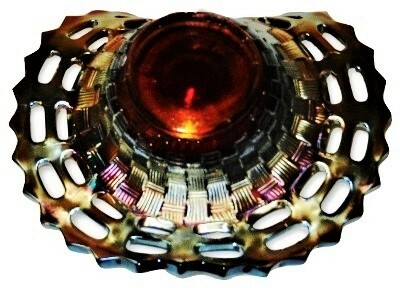 This item is one of the best examples we have ever seen in this shape and color. Measuring 5 1/2" X 5" X 2 3/8". No chips, cracks or repairs. Blue 2 Open Edge Jack in the Pulpit (JIP) shape. 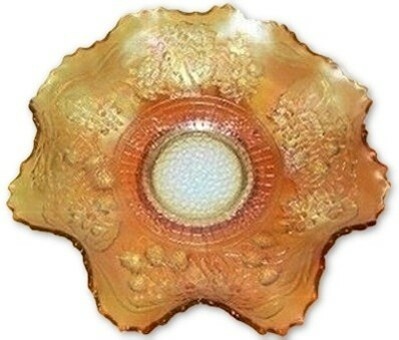 This item is one of the best examples we have ever seen in this shape and color. Measuring 6" X 3 3/4". No chips, cracks or repairs. *SCARCE* GREEN 2 Open Edge Jack in the Pulpit (JIP) Shape. 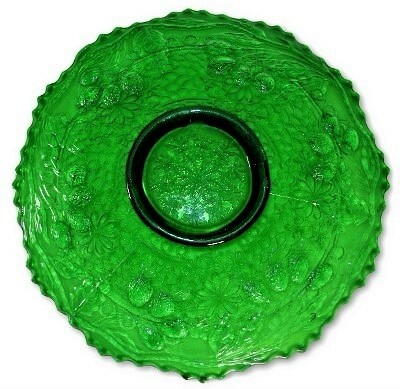 This item is one of the most beautiful and highly colorful iridescent finished green glass and finish you could wish for. Measuring 6" X 5" X 3". No chips, cracks or repairs. Cherry red iridescent finish on cherry red Open Edge jack in the pulpit. Basket weave exterior. Measures 5 1/2" X 4 1/2" X 2 3/4". No chips, cracks or repairs. Vaseline and marigold Open Edge Jack in the Pulpit (JIP) shape. 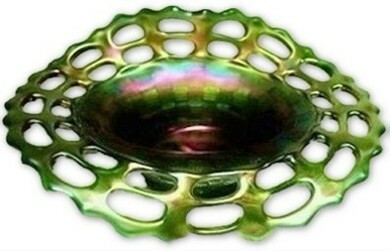 This item has fantastic rich iridescent finish and glows brilliant yellow/green when held to a black light. Measuring 6" X 5 1/2" X 2 3/8". No chips, cracks or repairs. Powder blue and marigold ORANGE TREE bowl with Bearded Berry back pattern. 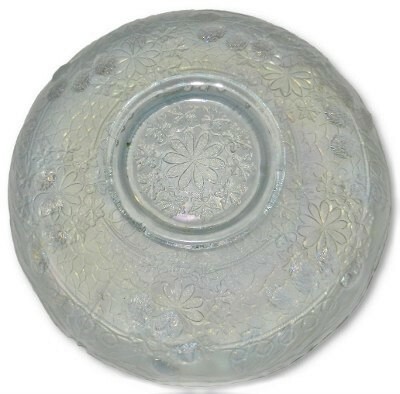 This item is extremely pale powder blue but is definitely not clear glass. Measures 8 1/2" X 2 3/4". 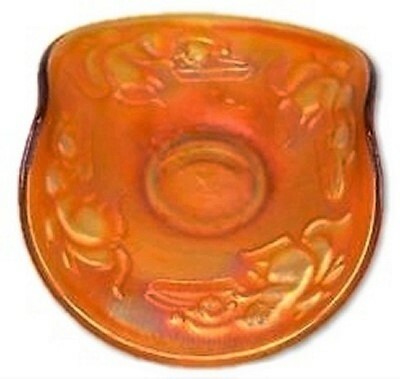 There is a small area of burn/scuff on the very edge of the bowl which measures about 1/4" long and appears to have been a manufacturing issue. No chips, cracks or repairs. 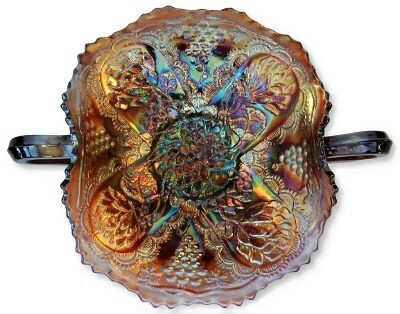 Cobalt blue ORANGE TREE hatpin holder. 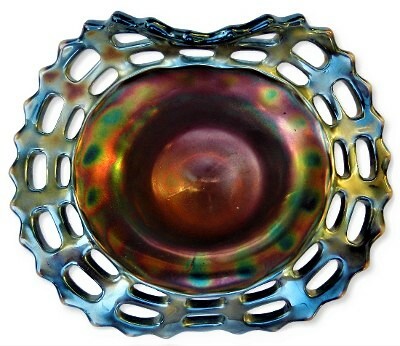 This item has a soft iridescent finish with a few minor areas of wear. As is very common for this shape, there is a couple very small 1/16th" flake on two foot, one of the oranges that has a flake. No other chips, cracks or repairs. 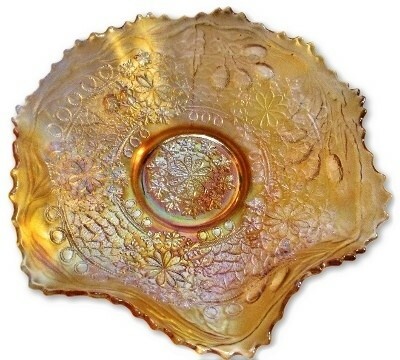 Marigold ORANGE TREE pattern 3 footed hatpin. 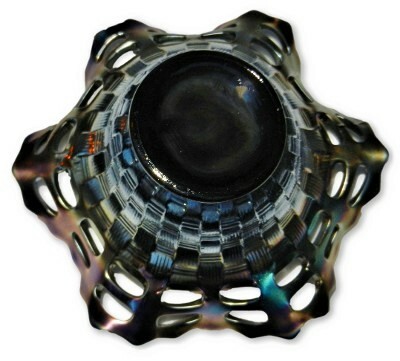 Stands 6 3/4" tall and measures 2 7/8" across at the widest point. As is very common for this shape, there is one extremely small flat flake at the very end of one foot. 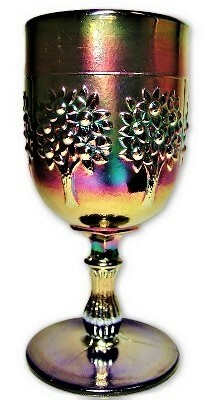 A small ribbon of slightly darker color is found inside the glass from the manufacturing process. No other chips, cracks or repairs. 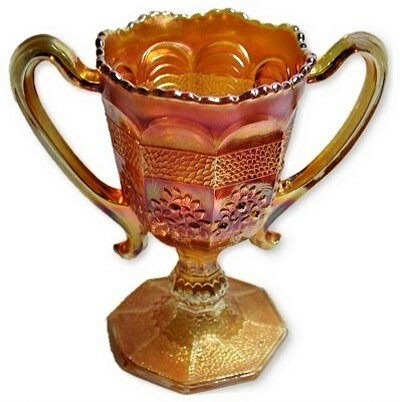 Marigold ORANGE TREE & PEACOCK TAIL pattern handled loving cup. The handles are often damaged on these but this example has excellent handles. 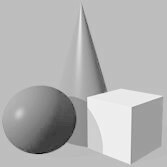 The foot does have some in the making anomalies where the several of the points have some indentations, they are not chips. No chips, cracks or repairs. 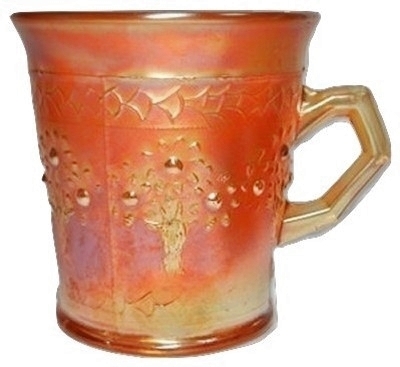 Amber Orange Tree mug. 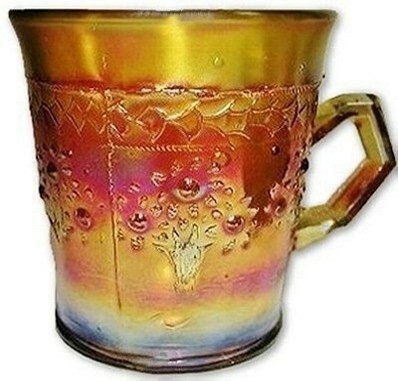 The coloration on this mug is tremendous with a great deal of red and the glass is amber. Measures 3 1/2" X 4 1/4" across to the outside of the handle and the base measures 3 1/2" across. No chips, cracks or repairs. 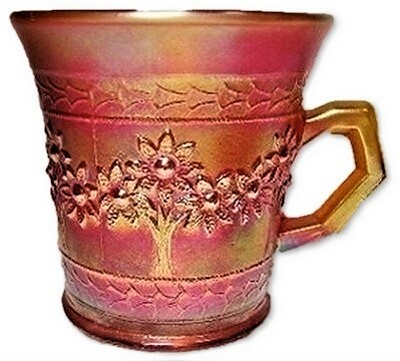 Dark cherry red to amberina Orange Tree mug. Measures 3 1/2" X 4 1/2" X 3 1/2". 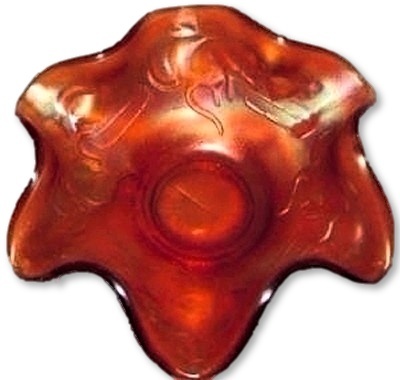 The only amberina in the deep cherry red glass is at the center of the base as shown in our image. No chips, cracks or repairs. 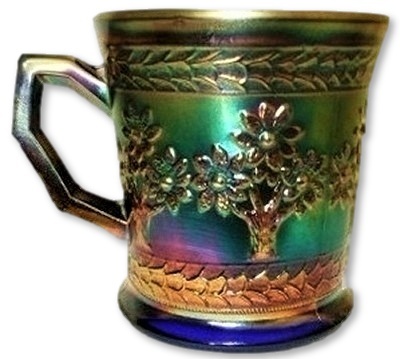 Brilliant cobalt blue ORANGE TREE shaving mug. Measuring 3 1/2" tall and 4 1/2" across from outside of rim to tip of handle. No chips, cracks or repairs. Blue ORANGE TREE shaving mug. Measuring 5" X 3 3/4" X 3 1/2". No chips, cracks or repairs. 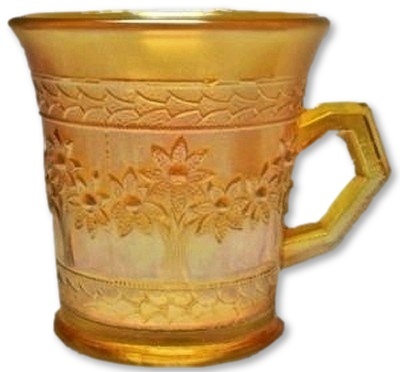 Marigold ORANGE TREE handled mug. Slightly uranium reactive when a black light is held to the base. Measures 4 1/4" across and stands 3 1/2" high. No chips, cracks or repairs. Powder blue and butterscotch Orange Tree mug. Measures 3 1/2" X 4 1/4" across to the outside of the handle and the base measures 3 1/2" across. No chips, cracks or repairs. 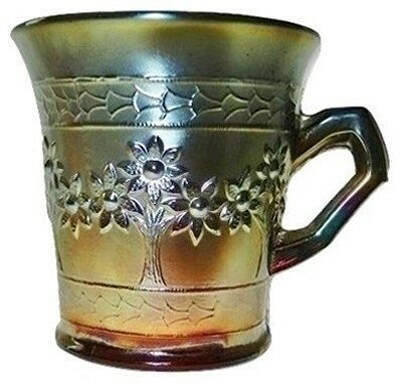 Powder blue and butterscotch Orange Tree mug. There is one extremely tiny flea bite on the bottom rim right at the spot where the seam shows, leading us to think it may have occurred in the making. Measures 3 1/2" X 4 1/4" across to the outside of the handle and the base measures 3 1/2" across. No chips, cracks or repairs. Pumpkin/amber Orange Tree mug. 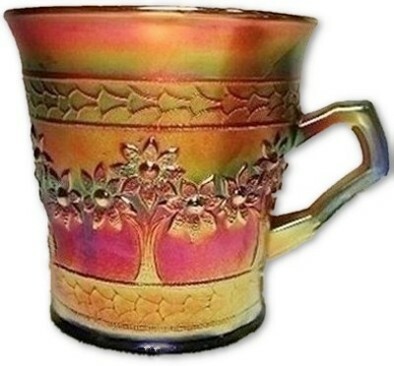 The coloration on this mug is tremendous with a great deal of red in the bold iridescent finish. 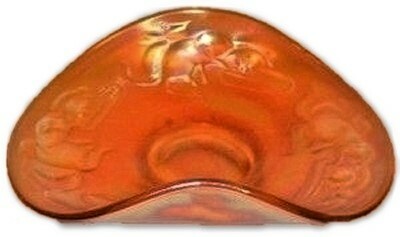 The glass itself appears to possibly be a pale amber. The top of the mug is slightly out of round with some in the making no harm dotting. The mug measures 3 1/2" X 4 1/4" across to the outside of the handle and the base measures 3 1/2" across. No chips, cracks or repairs. 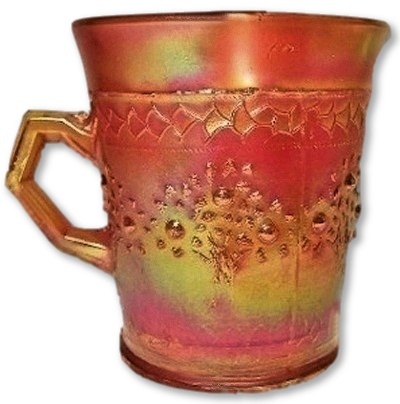 Dark candy apple red Orange Tree mug. Measures 4 1/2" X 4 1/4" X 3 1/4". 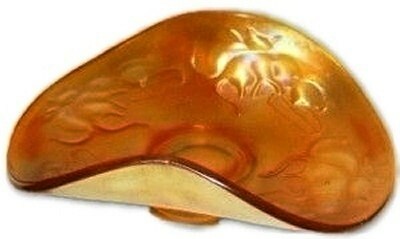 There is only the smallest amount of amber seen on the very bottom edge, not enough to consider this example as amberina. No chips, cracks or repairs. 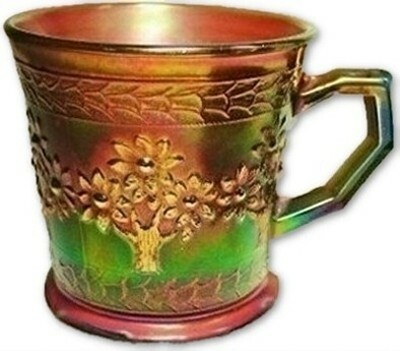 Root beer/lavender Orange Tree mug. 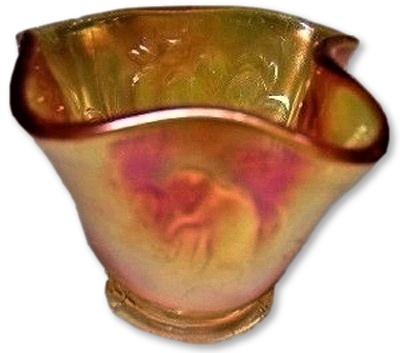 The base color glass appears to be root beer, while there is a very slight undertone of lavender. Measures 3 1/2" X 4 1/4" across to the outside of the handle and the base measures 3 1/2" across. No chips, cracks or repairs. 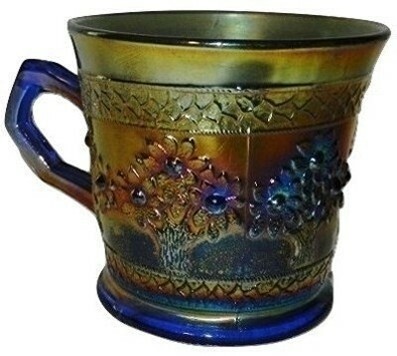 Sapphire blue or an unusual light blue colorful Orange Tree pattern shaving mug. Measuring 3 1/2" tall and 4 1/2" from outside of rim to outside of the handle. 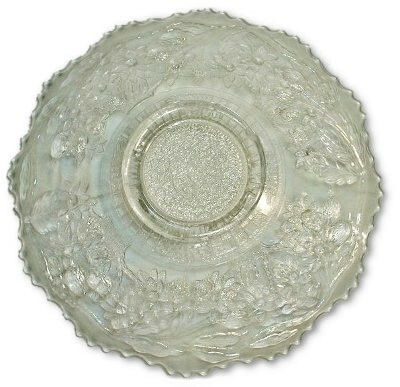 The base measures 3" across while the top rim measures 3 1/2" across. 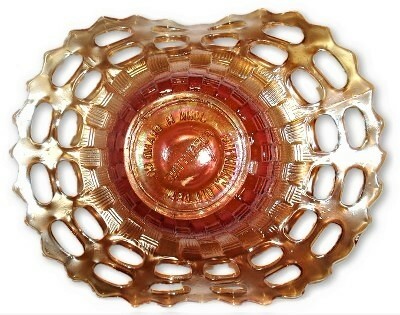 Add to the ODDITY of this item, the body side glass itself almost brick red with some hints of yellow at the rim. No chips, cracks or repairs. 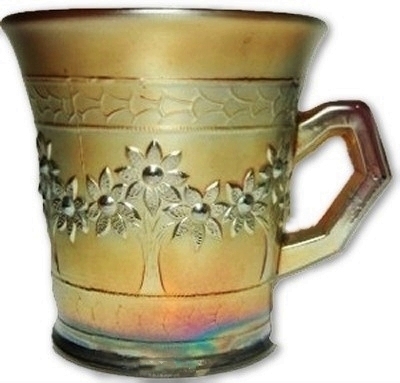 "RARE" yellow Orange Tree handled mug. The RARITY of true "yellow"at its best. 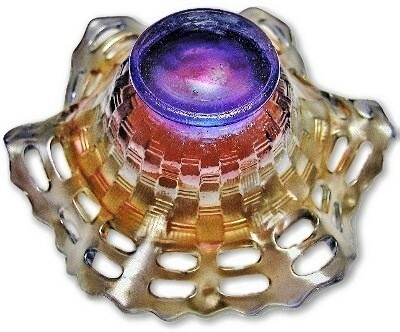 When this item is held under a black light, the base glows an opalescent yellow, similar to the yellow/green given off by Vaseline glass but absolutely yellow. 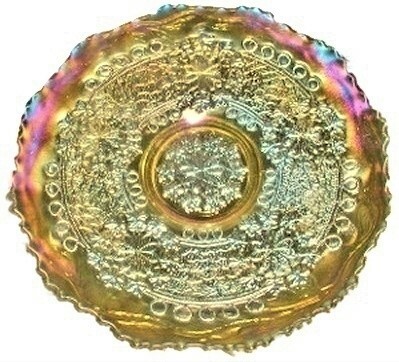 Measures 4" across at the widest point and standing 3 1/2" high. The handle has what appears to be an in the making heat check at the very center of the handle where it bends to a point. It is stable. Other this noted flaw, No other chips, cracks or repairs. 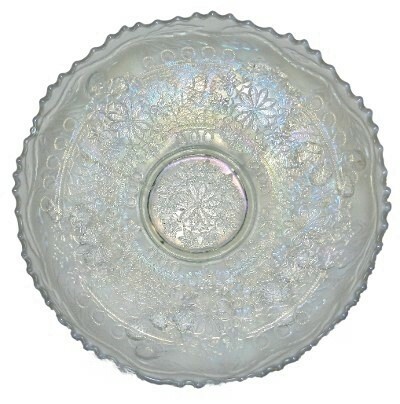 Pastel clam broth on light peach base glass, Orange Tree and Bearded Berry flat plate. Measuring 9 1/2" X 1". No chips, cracks or repairs. 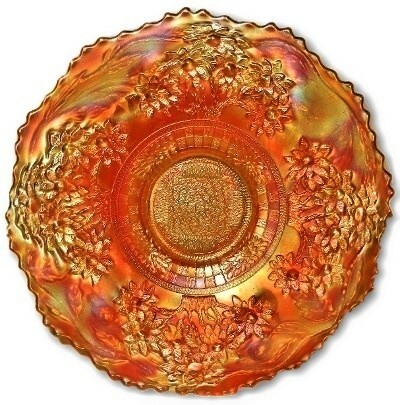 Pastel marigold Orange Tree and Bearded Berry plate. Measuring 9 1/4" X 1 3/8". No chips, cracks or repairs. Pumpkin marigold Orange Tree and Bearded Berry plate with the desirable tree trunk center. Measuring 9" across. No chips, cracks or repairs. White Orange Tree and Bearded Berry flat plate. Measuring 9 1/2" X 1". No chips, cracks or repairs. 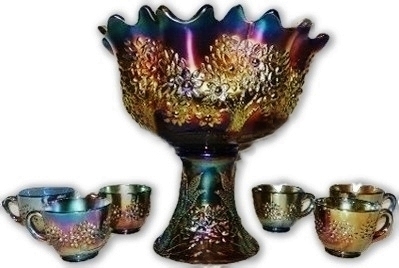 FENTON "ORANGE TREE" brilliant blue punch bowl, base and 5 punch cups (one free additional cup with base chip) to make a full set. 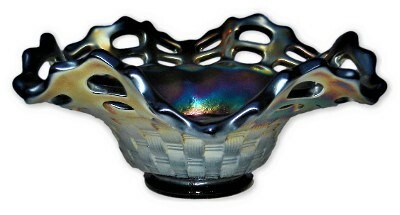 The iridescent finish on both the punch bowl and stand jump off the surface of dark blue glass. 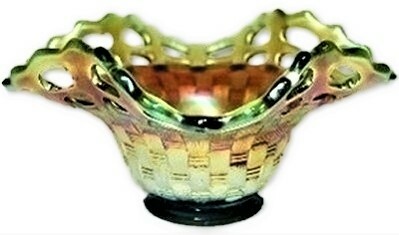 The punch cups range in iridescent quality from average to excellent. 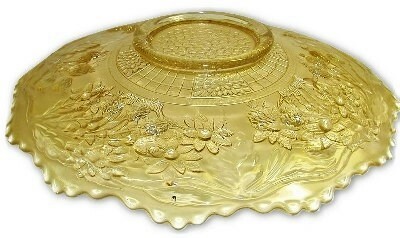 Overall height of the punch bowl and stand measures 10 1/8". 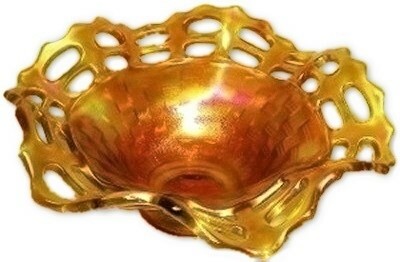 The bowl itself measures 10 1/4" across and sits 5 3/4" high. 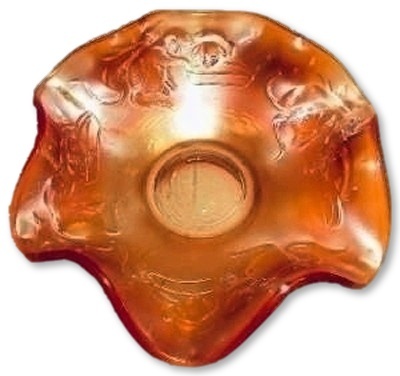 The base measures 5 1/4 across the bottom, 3 1/4" across its top and stands 4 3/4" high. 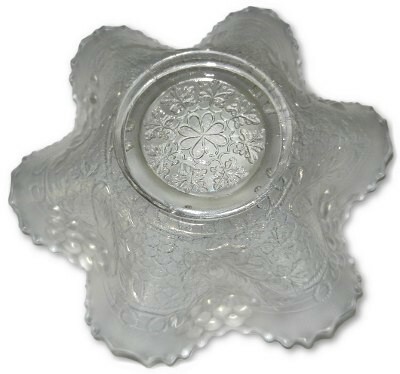 Punch cups measures @ 3 3/4" X 3" X 2 1/2". 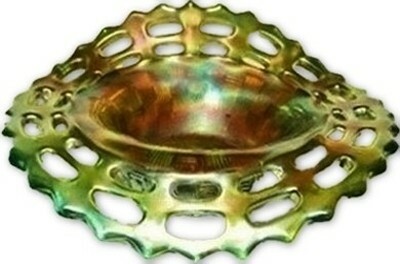 There is only small amounts of wear to the punch bowl interior and rim. 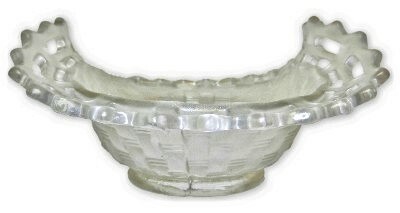 Condition of the Punch bowl, base and 5 cups, no chips, cracks or repairs. 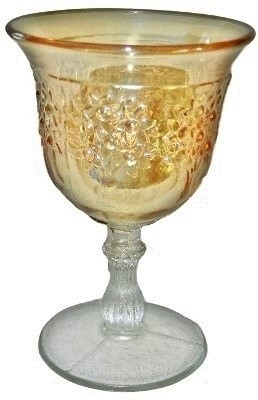 *SCARCE* aqua & marigold ORANGE TREE wine glass. 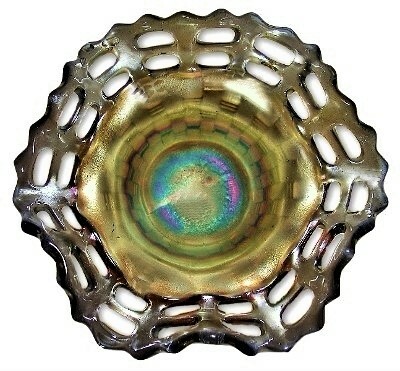 This item measures 5 1/2" tall and 2 1/2" across the top. No chips, cracks or repairs. Electric cobalt blue Orange Tree wine glass. Standing 5 1/2" tall and measuring 2 1/2" across. No chip, cracks or repairs. Cobalt blue Orange Tree wine glass. Standing 5 1/2" tall and measuring 2 1/2" across. There is from the manufacturing process a tiny flake/seam pull on the very bottom edge. No other chip, cracks or repairs. *SCARCE* exceedingly pale powder blue & pastel marigold ORANGE TREE wine glass. Measures 5 1/2" X 2 1/2". No chips, cracks or repairs. 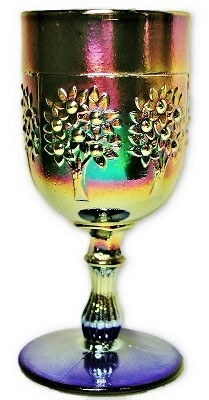 ORANGE TREE pastel marigold flared wine glass. Measures 5" X 3 3/8" X 2 3/4". No chips cracks or repairs.